Miriam and Sidney Stoneman Playground is the wonderful vision and result dedicated parents & volunteers. Seeing the need for a safe, city play space, a group of committed city parents spearheaded efforts to get the long forgotten playground back in action. To the delight of those who frequent the Esplanade with children, Stoneman is back and better than ever. 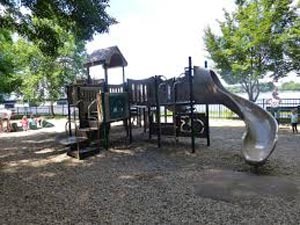 The playspace is conveniently divided into two separate, gated areas. A toddler playground is perfect for little tikes. Climbing structures, slides, swings (baby ones, too! ), and a pretend auto make this the place to be for those under three. Parents in need of a rest can relax on one of the many benches that surround the area. The view of the Charles River isn't so bad either. Older kids can let loose on a playground designed just for them. A challenging climbing structure, complete with fire pole, monkey bars, and more, will bring out the adventurer in your child. A tire and regular swings are favorites. The Volunteers have made this an extra special place to spend Sunday afternoons in the warmer months. Children can stop by on most Sunday afternoons from 2pm-4pm for supervised model sailboat racing and fishing. The sailboats are operated via remote control. Located along the Charles River on the Dudley Bike Path. Via public transportation take the Green Line to Copley and walk to Fairfield, crossing over Storrow Drive via the Fairfield footbridge.